(Princely Meals). Gammel Estrup, January 2018 ISBN: 978-87-995787-2-6. 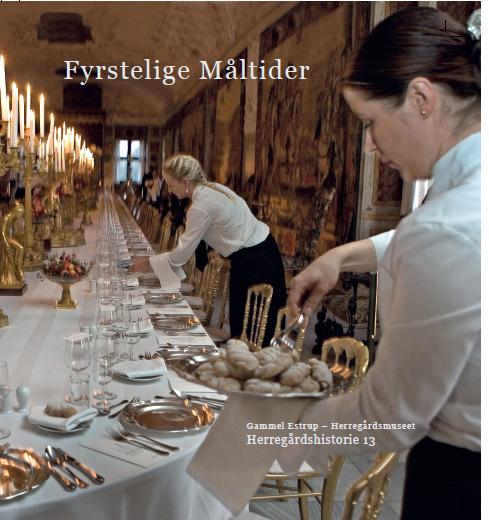 Gammel Estrup The Danish Manor Museum has just published the book Fyrstelige Måltider (princely meals). The book is about the food and meals that have been served by the richest and most powerful individuals and families over time. Thus, the reader is taken to both princes’, Count’s and King’s tables from the Middle Ages until today. The book describes the ranking at the meal, the table setting and the meal’s various forms of serving and the many delicious foods that were the basis of the refined dishes. The commodities were partly foods supplied from the manor houses and castles themselves, such as meat, butter, vegetables and fruit, and partly animals that the privileged classes had a special right to catch, for example freshwater fish and game. The meals also contained luxurious and expensive food items as olive oil, almonds and sweet chocolate as well as fresh fruit in the form of lemon and oranges. Fyrstelige Måltider gathers knowledge of the meals of the elite through centuries. It has been written by leading Danish experts in food history and the book will interest anyone with an interest in history and food culture.